Curious locals took the chance to walk through the tunnel ahead of the buses. People of Brisbane had a glimpse at the city’s latest piece of public transport infrastructure on Saturday. 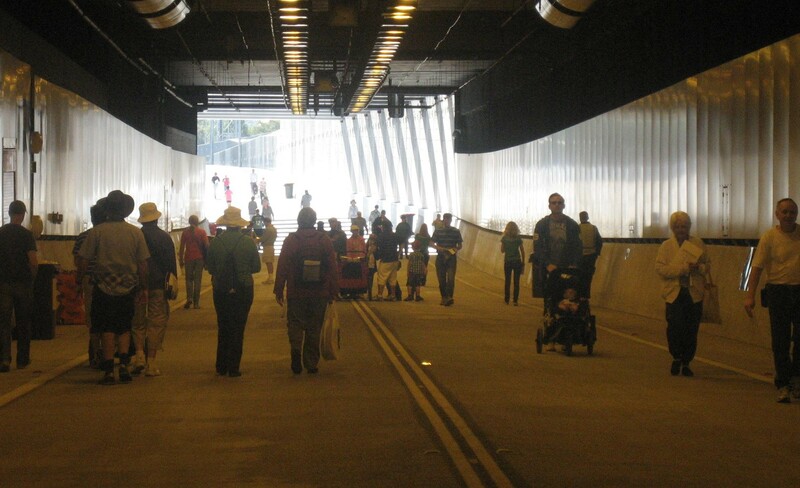 Brisbane’s northern busway tunnel between Lutwyche and Kedron was opened to the public, with families and friends exploring the project. The $444 million northern busway took three years to build – Thiess John Holland handed it over to the state government and TransLink earlier this year. The project includes busway stations in a high quality urban design and modern landscaping. The public were invited to walk through the 600 metre tunnel and talk to TransLink staff. The project has been a source of controversy during its construction, with noise complaints through to a threatened boycott by bus drivers. Talks between the Rail Bus and Tram Union and the government have resulted in cancellation of the boycott, triggered by drivers’ concerns they had not had the chance to become familiar with the tunnel before its opening. Premier Campbell Newman said the northern busway open day marked an end to a major project which would provide a boost to the public transport on the north side of Brisbane. “One busway lane can carry the same number of commuters as nine traffic lanes on Gympie Road,” he said. Minister for Transport and Main Roads Scott Emerson said the new busway would encourage more public transport. “This tunnel is at the heart of the Windsor to Kedron busway and will take hundreds of busses off the roads putting them underground,” he said. He said the tunnel buses would carry 12,000 busway passengers a day.